Lotto Premier winner Chris Topliss from the Belle Vue area of Carlisle receives his £ cheque from local agent Connell Steven. The lottery office will be closed from Thursday 23rd December until Tuesday 4th January. Any messages left by telephone (01228) 526237 (option 4) or email lottery@carlisleunited.co.uk will be answered on 28th December and 1st January subject to the scheduled Carlisle United matches take place on these days. Our regular weekly draws will take place on 23rd December and 1st January with prizes posted out (standing order customers) or delivered by your collection agent. 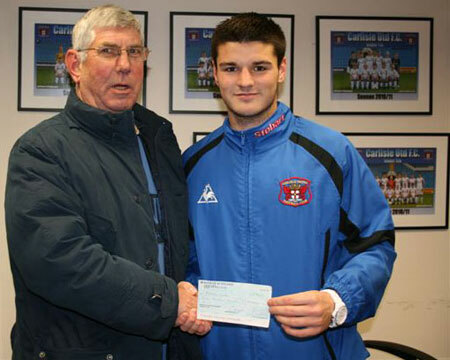 Our £1000 winner for October, Anthony Caddy from St Bees receives his prize from Ben Marshall. Congratulations to the following people who are all winners in the October Lotto Premier draw. Details will be sent out to you all by post later this week. 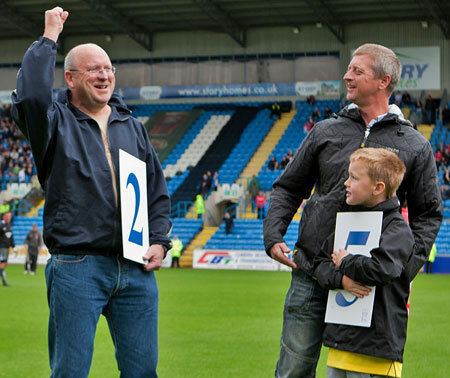 In our September draw 10 lucky members will be invited to attend our eliminator draw at a forthcoming fixture at Brunton Park. Our winner that day will have the option of taking home a new “60 registration” car or a cash alternative prize. The 9 runners up will all receive cash prizes. If you are not a Lotto Premier member yet please contact us at lottery@carlisleunited.co.uk for details on how you can have the chance of winning this and many other great prizes. 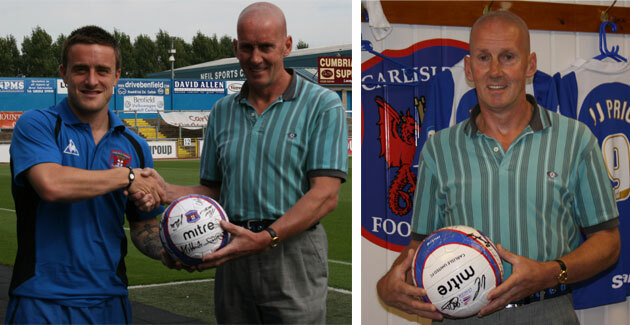 Lotto Premier winner, Mr S Pooley from Penrith is pictured receiving his prize of a signed Carlisle United ball from Matt Robson before paying a visit to the dressing room prior to the recent Swindon game. 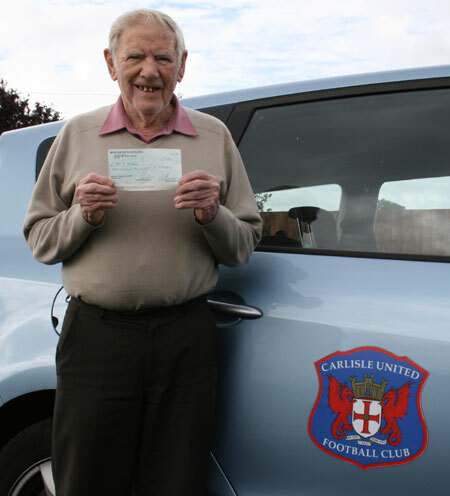 Tom McAvoy from Wigton receives his £1000 cheque won in the July draw. 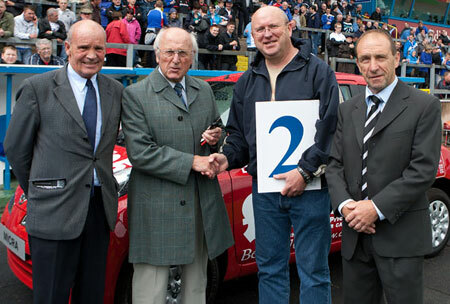 The final draw for the latest Lotto Premier car, a Nissan Micra supplied by Benfield in Carlisle took place at the Newcastle United friendly this afternoon. Our 10 finalists lined up for the eliminator draw with Andy Clode (standing in for wife Deb) and Chris Rivett going head to head for the final stage of the draw. 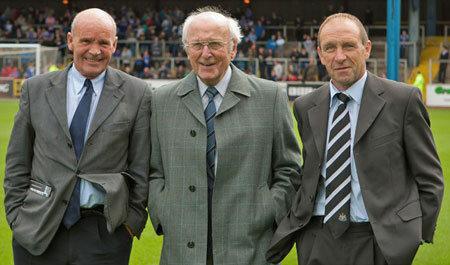 Chris was the winner and received the keys from our Brunton Park legends Alan Shoulder, Les O'Neil and Ivor Broadis. Marie Ferguson from Roslin near Edinburgh became the first Lotto Premier member to win 2 weekly draw prizes in the same week. Z6833 and Z5456 were the lucky numbers which won two £100 cheques for Marie in this weeks draw. Less than 10 people have won twice in the same week during the five years the Blues Lotto draw has been running. As well as the weekly prizes and new rollover draw, Premier members have their own exclusive monthly draws (limited to 1500 people) where there another £17,000 cash, 3 new cars plus much more waiting to be won. Membership is just £2 per week and an application form can be downloaded on this site! Lotto Premier winners for June will be published on this next week. We have just taken delivery of membership cards (Teamcard) for next season. These will be posted out or delivered over the next few weeks. Please use the contact facility on this site to infortm us of any name, address or bank details changes (standing order / debit card customers). 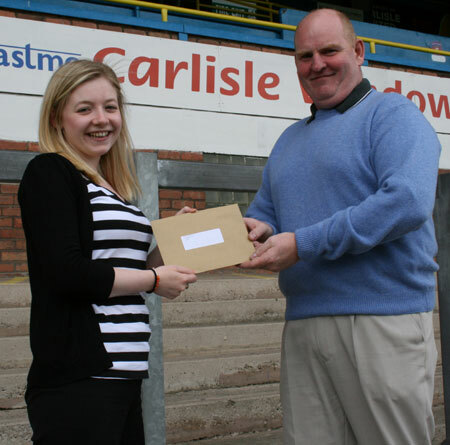 Our winner of 2 season tickets in our May draw, Bryan Glendinning came along to Brunton Park to receive his prize. Tarn from the Carlisle United ticket office helped him find a place to stand in The Paddock. 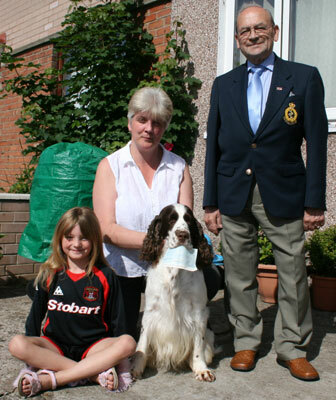 "Fly" the dog looks after our £1000 May Premier winners cheque for Shirley Watson from Harraby and daughter Bethany. It was definately a case of "beginners luck" for Shirley who has been a Premier Lotto member for less than a month. Lottery agent Arthur Brown presented the cheque. Please note: The original Premier Club membership numbers have now received a 22 or 23 prefix before the membership number. Membership numbers 1-999 have become 22001-22999. Membership 1000 and above becomes 23,000 onwards. This change has taken place to give Premier members the chance of winning prizes in the weekly draw. The draw is planned to take place at the Newcastle United Centenary Match in July or our 1st home league fixture of the new season. CORPORATE DRAW WINNERS- Malcolm Fawcett, Houston, Texas. Kevin McGeorge, Carlisle. Armstrong Watson, Carlisle. Border Food Machinery, Carlisle. 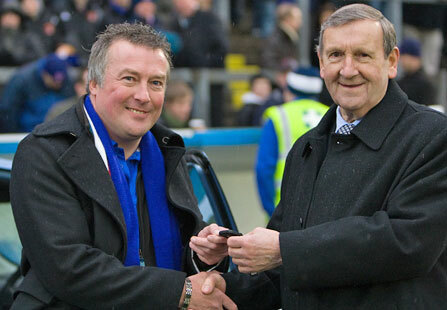 Ten lucky Premier Club members took to the Brunton Park pitch during half-time at the Stockport game on 23rd January all hoping to win a new Nissan Micra or our new alternative cash prize. The 10 finalists taking part in the exciting eliminator style draw were Harold Bowron (member 211), John Tremble (959), Trevor Barwick (155), Eric Hope (448), Nigel McHard (313), Douglas Grubb (327), John Notman (476), Tony Finnigan (421), Chris Green (214) and Jonathan Jordan (340). Each finalist received a cash prize which increased the longer they stayed in the draw. Douglas Grubb from Boroughbridge holding board 6 and Harold Bowron from Edinburgh with board 1 were the final 2 remaining in the draw with Carlisle United Club President, David Dent drawing Douglas's ball number 6 as the winner. 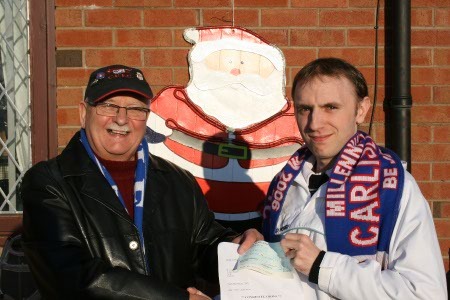 Tommy Heenan from Carlisle will be having a very happy Christmas after winning £5000 in the December Premier Club draw. 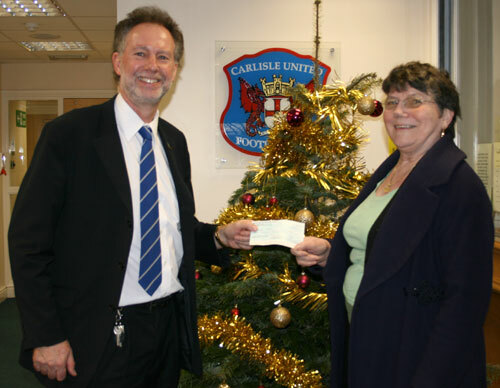 Our £1000 monthly winner is Blanche Tiffin also from Carlisle who received her cheque from Carlisle United Operations Manager, Nigel Dickinson.